There are some places you shouldn’t stop halfway – a road, for instance. Maybe you’re thinking, Well, Pete, I’m a middle-of-the-road kind of person. Listen, there really are some things in life that require you to go 100 percent of the distance or you’ll miss out on life, and maybe even get killed. I was in Hong Kong in 1982, shortly after the Chinese border reopened to Westerners. My friend had grown up as a missionary kid in China, so he offered to take me into China. When we arrived at the border, there was a bridge. On that bridge we were neither in Hong Kong nor China. What if we’d said, “You know what? We’re tired. Why don’t we stop here in this “No Man’s Land”? What would you say to someone who wants to know God through Scripture but stopped reading at the end of Malachi, where God says, “… or else I will come and strike the land with total destruction” (Malachi 4:6)? You’ve realized the emptiness of marching, and you’ve decided to stop. This is such a great start. But don’t stop before you become a dancer. Don’t stand in the middle of the road between law and grace. Living life half-surrendered to God’s Spirit isn’t the adventure God has for you. Lord, I’ve stopped marching and I am so excited! But I know there is more to the Christian life than simply leaving the law behind. Prepare me to go the full distance. Transform me so that I’m “all in.” Lead me into the dance. Amen. What do you pray for? Your family? Your relationships? Financial stability? It’s good to bring these things before God, but your prayer life can be so much more. Jill Briscoe wants to show you how to unlock the earthshaking power that’s at your fingertips. 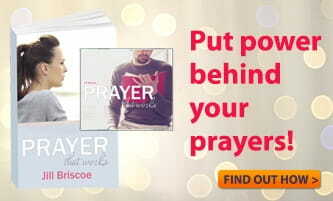 Request her book, Prayer That Works, today!